Indoor mold growth is a well-known problem for buildings and facilities, but many people don’t recognize the role that insulation plays in preventing mold growth. Because it’s designed to control temperature and moisture, mechanical insulation is one of the most powerful tools available for controlling mold. When it’s correctly installed, mechanical insulation creates dry, temperature-controlled conditions that inhibit mold growth. Mold needs humidity, warmth, and a source of food in order to grow. Insulation’s role in preventing this growth has to do with its ability to control condensation. 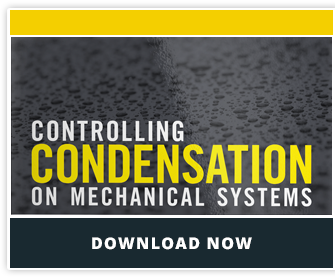 When warm, moist air comes into contact with cooler surfaces—like industrial pipes or HVAC equipment—condensation forms, creating the perfect environment for mold to grow. In the right conditions, mold can grow almost anywhere. Aluminum ductwork, brick, plaster, and glass are all prime candidates for mold. Insulation serves as the first defense against moisture and condensation in a building by preventing air from reaching dew point temperatures. But if the insulation is not properly installed, the building won’t ever see these benefits. In fact, improperly installed insulation can actually contribute to mold problems deep within the building’s walls. As with any specification in a building, there are a variety of insulation options available depending on your specific application. Different insulation materials are susceptible to mold growth in varying degrees, so the specifier or insulation contractor will be able to specify the correct insulation type for the intended purpose. For example, fiberglass insulation is resistant to mold growth, while cellulose-based insulation is the ideal food for mold. Even a small area of missing or damaged insulation can cause a major mold problem. The most basic, yet often most overlooked, aspect of insulation is proper installation. It may be helpful in new construction to consult the architect in order to design the correct insulation configuration. For optimal results, the insulation system should be designed with other building systems in mind. Insulation is just one of many materials and functions that works with other systems in a building to create a comfortable indoor environment. For example, you could increase the filtration efficiency of you HVAC unit to reduce the amount of particles flowing through ducts and providing a food source for mold. Specifiers, installers, and maintenance professionals should all consider the building systems that are immediately related to insulation and adjust them to support its functionality. The best way to prevent indoor mold growth is through cooperation and buy-in by all players. Proper planning, installation and maintenance can help reduce the risk of mold growth and lead to a safer and more comfortable building for years to come.